Coffee and talk: Photographed at the launch of the new dementia café, which will open in Belmullet this month in Sonas Ti Aire Nursing Home, were (l-r): Christine Cronin (manager), Christy McHale, Bridget Hegarty (activities coordinator), Pauline Gallagher (health care assistant), Ann Monaghan (kitchen supervisor), and Rita Scott (activities coordinator). 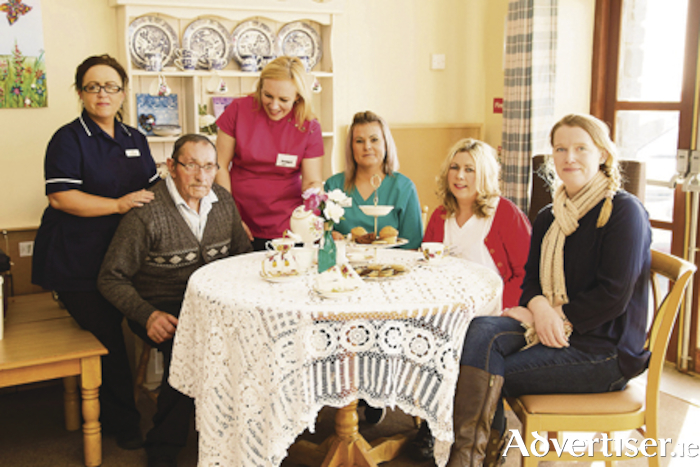 Sonas Ti Aire Nursing Home will be launching Belmullet's first dementia cafe on Monday, March 26, from 2-4pm. Dementia cafes provide a warm and welcoming space for people with dementia, their family and friends and social and health care professionals to meet, exchange ideas and learnings. The cafe will be open the last Monday of each month. Launching the cafe will be Senator Rose Conway Walsh and Paddy Gannon, the family support officer for Western Alzheimers, will be there to give a talk and answer any questions you may have. Admission is only €2 which includes tea/coffee cakes and the talk. All money raised will go to Western Alzheimers. All carers, familly members, friends, and health care professionals and anyone from the community who wishes to go along to Belmullet's first ever Dementia Cafe are invited.